Monday, September 18, 2017, 9:30 a.m. and 11:30 a.m. TICKET PRICES : $10 General Admission. $7 for students -- to purchase or receive an invoice for your class, call the Box Office at 408-961-5858, Monday-Friday, 10am-4pm. The Ramayana is an ancient Indian tale of the virtuous Prince Rama, who must plot to rescue his beloved Sita when she is kidnapped by the demon king known as Ravana. More than a simple story, The Ramayana illustrates the teachings of ancient Hindu sages using various literary elements, combines philosophy and ethics, and had great influence on art and culture in the Indian subcontinent as well as throughout Southeast Asia. 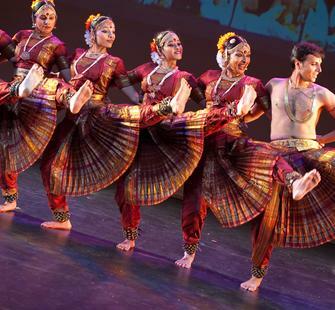 Here, Mallika Sarabhai and her troupe retell this classic struggle between good and evil in the dance style of Bharatanatyam.